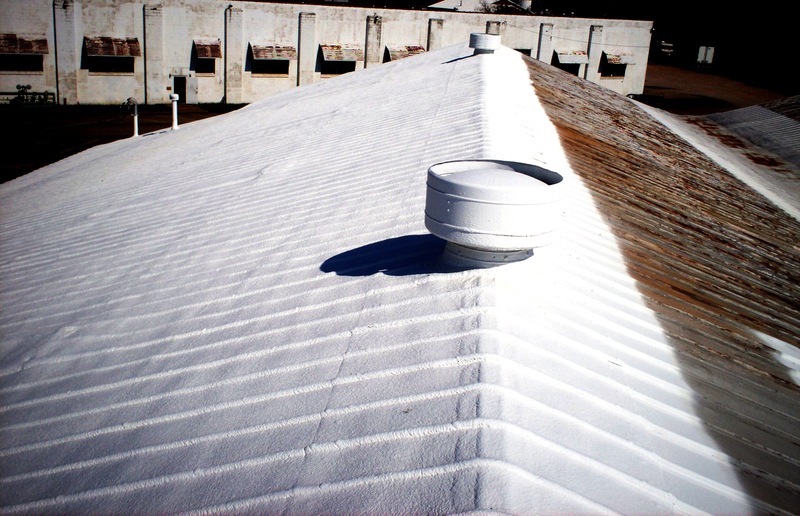 Project: Stirling Technologies – Redo sections of metal roof. 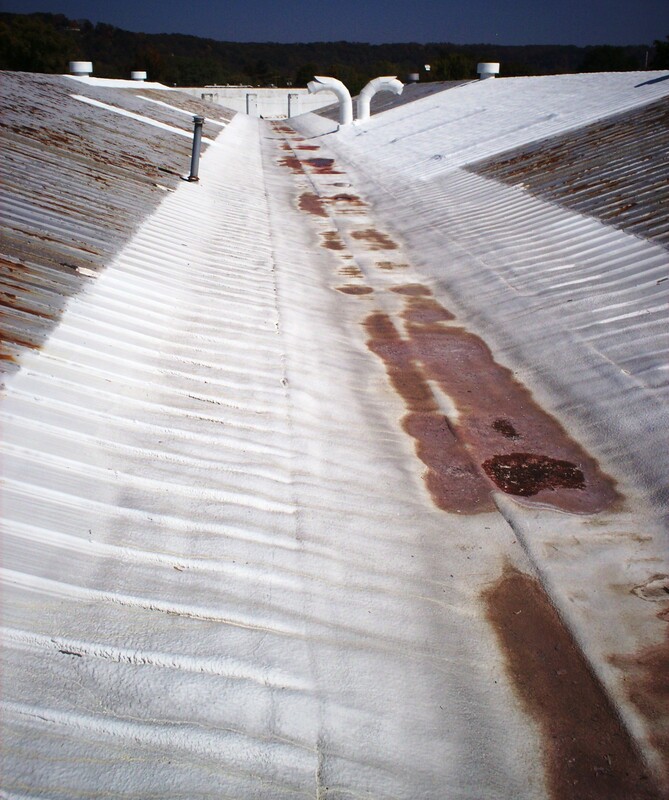 Stirling Technologies – Redo sections of metal roof. Stirling’s roof was really three roofs. It consisted of three metal peaked roofs over the single structure. 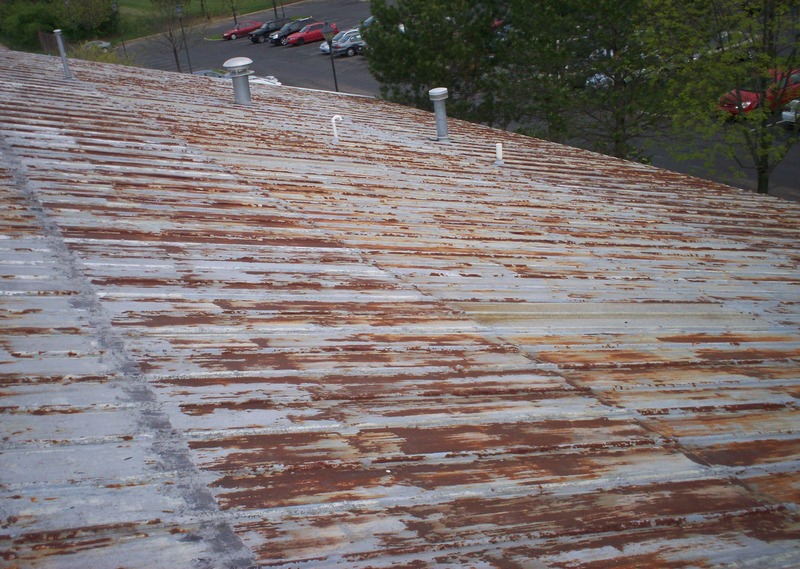 The roofs had aged with rusted metal, fiberglass skylight panels that had become brittle and a roof that had multiple leaks. The company had to have leaking stopped over critical areas such as labs, offices and leased space, but needed to minimize its financial outlay. The skylights contributed to the leaking problems as well as being a danger to anyone on the roofs, including FoamCoat crews. They needed to be made safer. There were two valleys between the three sections that were over 200 feet long that had severe “ponding” issues and were leaking badly at various points. Because the company’s goal was to do only “what had to be done”, the analysis of bad areas and how large the sections were that needed done was critical. Attached board over all skylights in the portions of the roof being done and over selected other skylights. The selected sections of the roof were foamed with Lapolla foam. Valleys were built up with foam at depths needed to raise extreme low spots and build up deteriorated edges with a goal to minimize standing water and improve drainage. 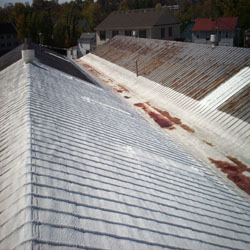 Neogard Silicone was applied over the foam applied to selected metal roof sections. Neogard Urethane was applied over the valley areas. 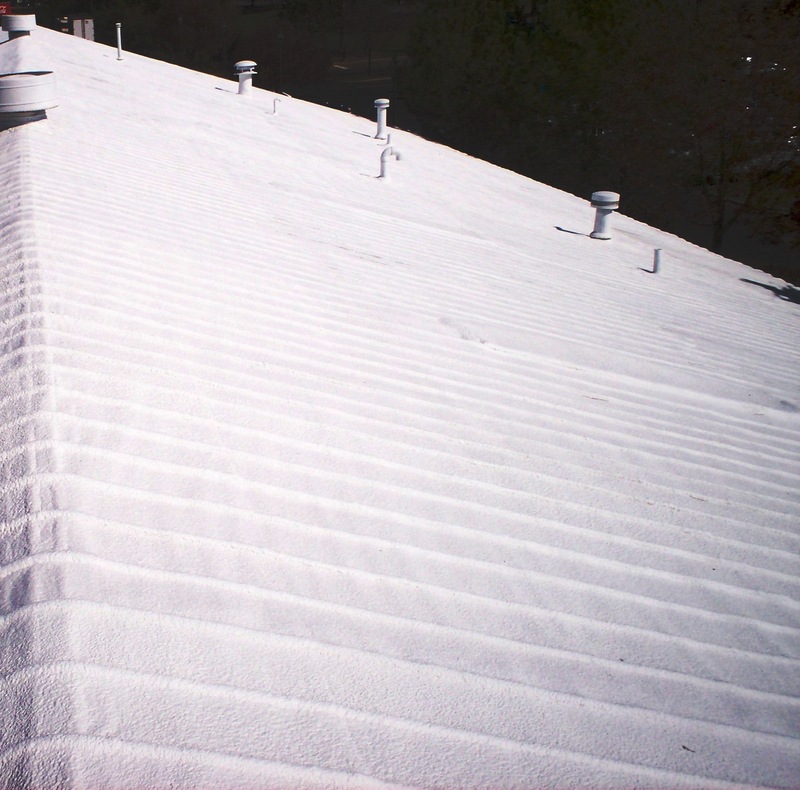 This was done per the customer’s expectation of doing other sections of the roof in the future that would require foam and coating to tie into the valley areas. The key objective of stopping critical leaks has been accomplished. The roof is safer with the skylights covered and foamed. The valley areas between the building's three peaks are no longer leaking and drainage has been improved with no deep “ponding” areas. The customer is pleased that their objectives have been met without overextending themselves financially and plans on doing the other areas as finances allow. 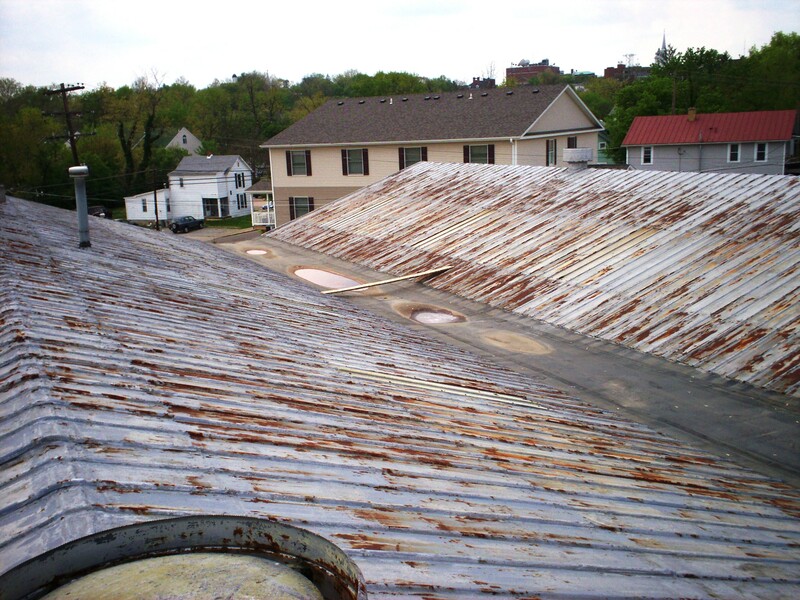 They are excited that much of their aged, rusted, leaking roof is now non-leaking, the appearance has been improved, there is significant added insulation value and the metal is protected from further exposure and deterioration.